The original organ located in the rear balcony was built by Henry Erben of New York and was dedicated June 1, 1866. 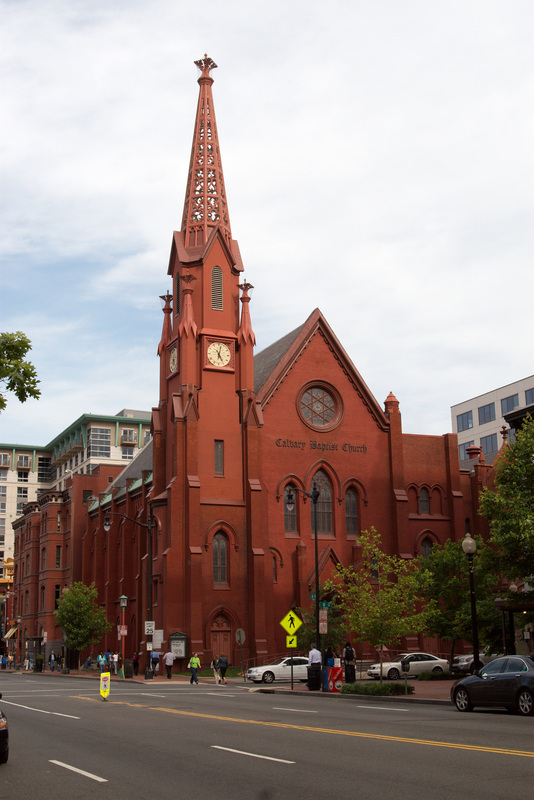 There is no record of the organ built following the December 1867 fire. When the balconies were added in 1895 a three manual Woodberry tracker-action organ was installed at the front of the Sanctuary over the baptistery. In 1927 M.P. 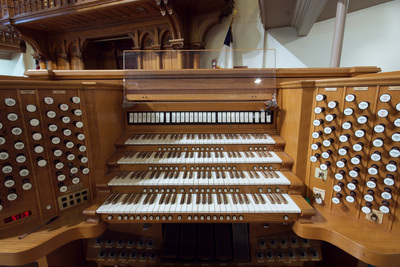 Moller built the next organ (their opus 4902), to replace the Woodberry, with 86 ranks and 5,000 pipes played from a 4 manual console; it was the largest organ in the city, a condition of the Woodward family gift (the rogan in the Great Choir at Washington National Cathedral was not installed until 1938. The main organ consisted of five divisions at the front of the Sanctuary and a three mania; antiphonal. The organ was to be played through lines leased from the telephone company to the Woodward & Lothrop department store. Moller added a pipe display in the store with speakers behind them. This organ has the only 32’ Open Wood in the city. The organ was modified over the years, the console being moved from front center to the side, then to back and adding additional ranks to the antiphonals. 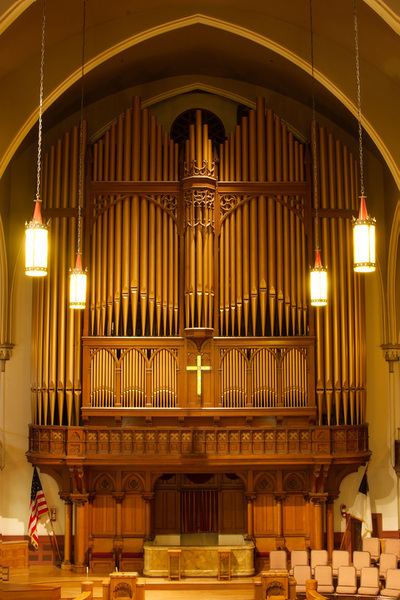 Due to decreasing membership and deferred maintenance the organ was near total failure by 1991. The M.P. Moller Company was awarded a $450,000 contract to rebuild the organ (to have been their opus 11841), the church had made approximately $225,000 in progress payments when Moller entered bankruptcy, Irv Lawless was hired to retrieve and store the pieces from the Moller factory. The Wicks Organ Company was contracted with to complete the project, limited by the remaining available funds. There is still much work to be done to return this instrument to its former glory. Console was originally in front of the church. Moved to rear gallery in 1946 because the choir was up to 120 people. Gallery organ was 29 ranks! Organ was to be rebuilt by Möller in 1992. After it was removed and in Möller factory, Möller closed. Organ was removed from Möller and rebuilt by Wicks.